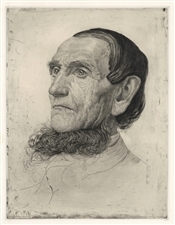 Otto Fischer original etching "Head Study"
Medium: original etching. Published in Vienna in 1901 by Vervielfaltigende Kunst for the "Kunst in Wien" portfolio. A rich, magnificent impression with plate tone printed on heavy wove paper. The plate size is 12 x 9 1/4 inches (310 x 240 mm) and the sheet size is 15 1/4 x 10 inches (385 x 255 mm). Not signed. Condition: the margins have been trimmed on the right and left sides.